E. Touchet: La Planete Mars, La question des canaus. p 249 Fig 10. After observations made in 1909 in Meudon. (Planishpere). La Nature, Revue des Sciences 1910. Paris. R. G. Aitken: Publications of the Astronomical Society of the Pacific Vol. 22, No. 131 (April, 1910), pp. 78-87. In: Kulin György: A Távcső világa. Budapest 1941. 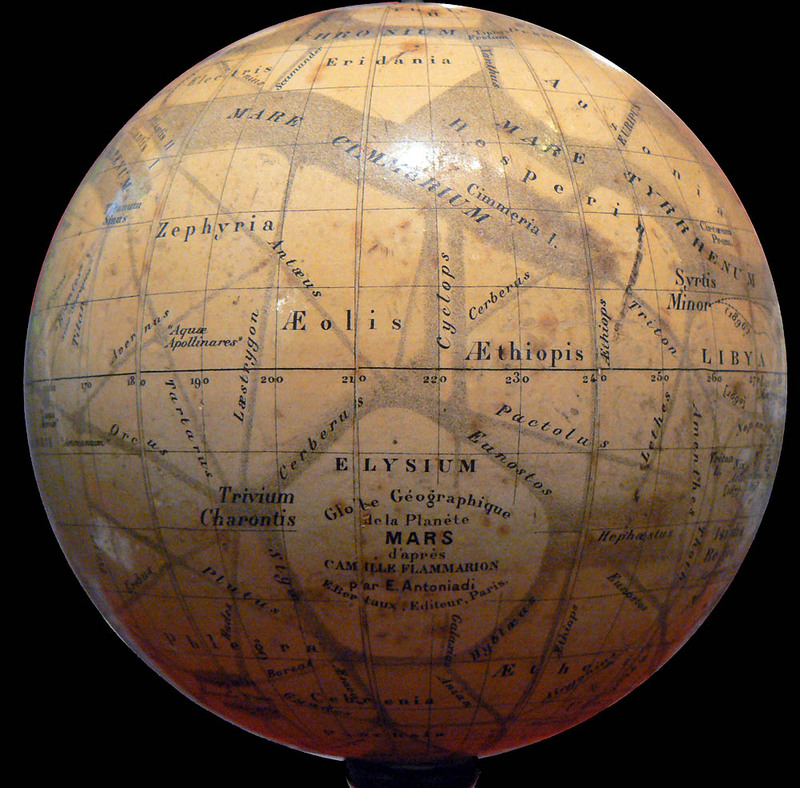 Antoniadi’s 1929 map reprojected onto the shaded relief map of Mars. Courtesy of Ton Lindemann. Projection: Two hemisphere maps in polar azimuthal equidistant projection. Source: The Planet Mars. 1st edition: 1930. Translation Keith Reid Limited 1975. 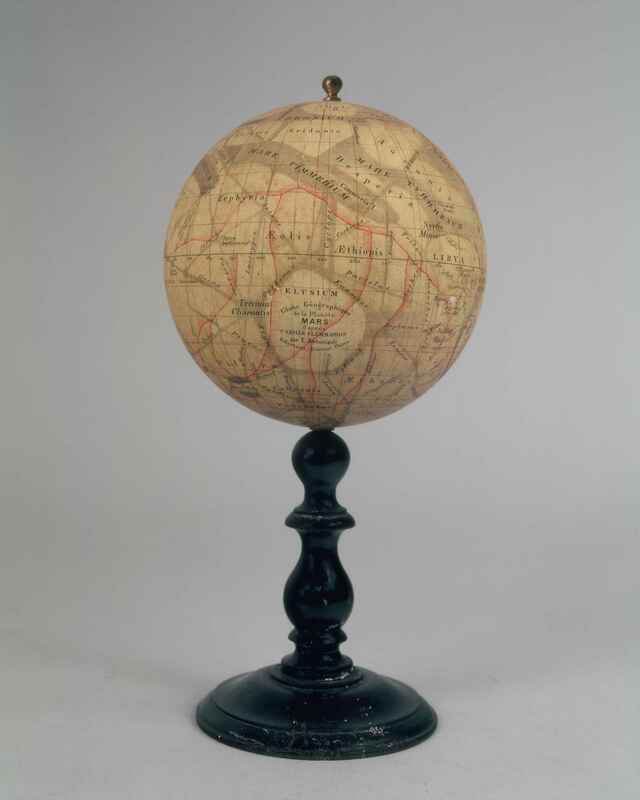 La planète Mars : étude basée sur les résultats obtenus avec la grande lunette de l’Observatoire de Meudon et exposé analytique de l’ensemble des travaux exécutés sur cet astre depuis 1659 – Paris : Hermann et Cie, 1930. – 239 p., pl. Section for the observation of Mars : Report of the section 1896, 1898, Memoirs of the British astronomical association : reports of the observing sections, 6, p. 55-102, pl. Section for the observation of Mars : Report of the section 1898-1899, 1901, Memoirs of the British astronomical association : reports of the observing sections, 9, p. 63-106, pl. 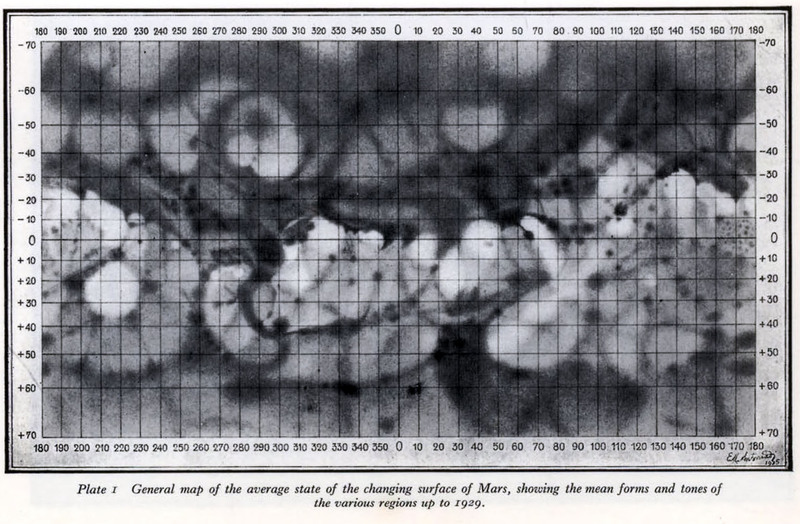 Recent observations of Mars, 1902, Knowledge, 25, p. 81-84, 1 pl. Considerations on the planet Mars, 1903, Knowledge, 26, p. 246-249, 1 pl. Section for the observation of Mars : Report of the section 1900-1901, 1903, Memoirs of the British astronomical association : reports of the observing sections, 11, p. 85-142, pl. Observations de Mars et de ses satellites avec le grand équatorial de l’Observatoire de Meudon, 1909, Bulletin de la société astronomique de France, 23, p. 488-494, 4 pl. Observations de Mars avec le grand équatorial de l’Observatoire de Meudon, 1910, Bulletin de la société astronomique de France, 24, p. 31-35, 2 pl. Section for the observation of Mars : Report of the section 1903, 1910, Memoirs of the British astronomical association : reports of the observing sections, 16, p. 55-104, pl. Section for the observation of Mars : Report of the section 1905, 1910, Memoirs of the British astronomical association : reports of the observing sections, 17, part 2, p. 35-64, pl. Section for the observation of Mars : Report of the section 1907, 1910, Memoirs of the British astronomical association : reports of the observing sections, 17, part 3, p. 65-112, pl. 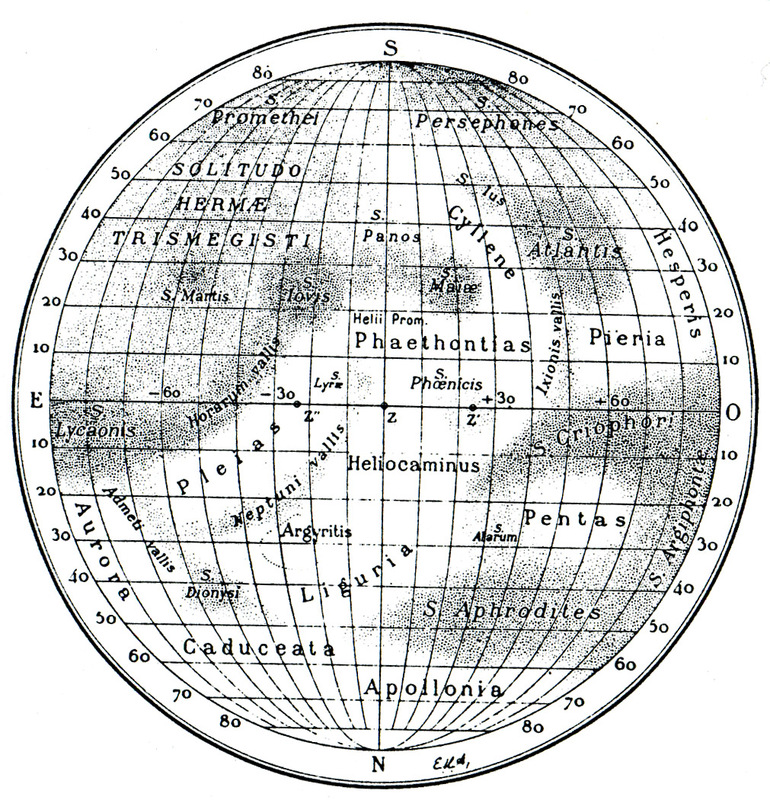 L’aspect physique de la planète Mars, 1911, Ciel et Terre, 32, p. 209-222, 2 pl. On some drawings from photographs of Mars taken in 1909 by Professor Barnard andProfessor Hale, 1911, Monthly notices of the royal astronomical society, 71, p. 714-716, 2 pl. Section for the observation of Mars : Report of the section 1909, 1915, Memoirs of the British astronomical association : reports of the observing sections, 20 part 2, p. 25-92, pl. Section for the observation of Mars : Report of the section 1911-1912, 1916, Memoirs of the British astronomical association : reports of the observing sections, 20 part 4, p. 113-178, pl. Section for the observation of Mars : Report of the section 1915-1916, 1920, Memoirs of the British astronomical association : reports of the observing sections, 21 part 4, p. 87-114, pl. L’atmosphère de Mars, 1924, L’Astronomie : bulletin de la société astronomique de France, 38, p. 49-57, 1 pl. Considérations sur la planète Mars, 1924, Ciel et Terre, 40, p. 1-11, 1 pl. astronomique de France, 40, p. 120-122, 1 pl. Le retour de la planète Mars, 1926, L’Astronomie : bulletin de la société astronomique de France, 40, p. 345-352, 1 pl. Le retour de la planète Mars, 1928, L’Astronomie : bulletin de la société astronomique de France, 42, p. 564-568, 1 pl.